"... the 38 mixed voices of Trinity College Choir, again very well trained, especially in matters of firm text enunciation. They are less raw in the lower voices, more focused overall than the Thomaners and more agile, too, in numbers such as ‘Ehre sei Gott’ or the opening of Part 5. The soloist line-up here is in general superior both technically and interpretatively, especially the ever-incisive James Gilchrist. Newcomer Katherine Watson’s fresh-voiced sound is a world away from the Leipzig boys but Iestyn Davies’s impressive messa di voce in ‘Schlafe, mein Liebster’ is not the start of a performance to match the protective warmth of Danz. If not quite at its best, the Orchestra of the Age of Enlightenment sounds thoroughly at home (David Blackadder gives a very suave trumpet solo in ‘Grosser Herr’), and Stephen Layton conducts with care and expertise". Christmas music is so often recorded in unseasonal mid-summer that it makes a nice change to be here in Cambridge’s Trinity College Chapel on a chilly January afternoon for the first session of the Christmas Oratorio. Stephen Layton’s performances of the six cantatas that make up the oratorio have become a regular festive feature at London’s St John’s Smith Square, so everything is still fresh in everyone’s minds from having just sung and played them in December. I arrive just as the process of microphone-adjusting and knob-twiddling has started, with the Orchestra of the Age of Enlightenment giving the control room some level in the second cantata’s Sinfonia. There is something unconventional about the orchestra’s configuration. In the chapel’s chancel the players are arranged in a circle with Layton conducting in the middle. As Steve Johns, the producer, explains, there are acoustical and logistical reasons why this should be so: the available space is quite constricted, and it makes for a truer ensemble to have the orchestra in the round. Johns has made many recordings in Trinity’s chapel, so he knows what’s what. The choir and soloists, when they arrive for subsequent sessions, will be placed behind the orchestra, nearer the altar. Layton describes this arrangement as a ‘win-win situation’, allowing him closer eye contact with all the players and making for an interesting ‘sonic picture’. After the break, the rest of the afternoon is set aside for recitatives and arias, starting with Iestyn Davies in the countertenor’s ‘Schlafe, mein Liebster’ from the second cantata. The obbligato flute stands next to him. The balance is tweaked, and, aside from one or two promptings about German pronunciation, the takes pass off without undue incident. At this point, with ‘Schlafe, mein Liebster’ finished, most of the orchestra depart. Aside from the oboes, flutes and those on the continuo line, nobody else is needed for Matthew Brook’s bass recitatives ‘Was Gott dem Abraham verheissen’ and ‘So geht denn hin’, nor indeed for the three countertenor recitatives later on. This leads me to ask Layton how he organises the schedules so that players and singers are not hanging around unnecessarily. There are six cantatas here, spread over 10 sessions, all of them with different instrumental and vocal components. The answer? A database. For these large-scale choral works, Layton can design a detailed timetable from information stored on computer. The result, for the Christmas Oratorio, is a six-page document dividing the piece up not chronologically but into time- and manpower-efficient segments, with durations specified down to the last second. This prompts a further question about continuity. Layton draws a comparison with other Bach masterpieces – the B minor Mass or the Passions – in which recordings need to be done in substantial dramatic chunks. 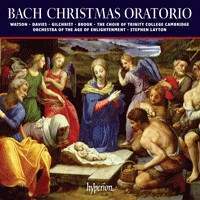 The Christmas Oratorio, with its discrete cantatas, individual numbers and longer reflective arias, lends itself to more piecemeal recording procedures, although Layton makes the point that there is a cumulative impact in performing all six and that it is important to recognise the music’s overall span by not, for example, introducing a ritardando at the end of the first cantata. Experience also counts for a lot here. Layton and his musicians have been working closely on the Christmas Oratorio for three years. They know it inside out. The Trinity College Choir has been trained to sing the oratorio from memory. And, as he says, the fusion of young voices with a professional orchestra adds a special frisson.